The Grand Central M4 is chock-full of microcontroller goodness. There's also a TON of pins and ports. We'll take you a tour of them now! There's a lot of ways to power the Grand Central M4 Express, and a lot of ways to get power out as well. On early versions of the board the status LEDs were mislabeled. In this image, the yellow text is the correct labeling. D2-D9, D11, D13-D45, D48, D50-D53. MISO, MOSI, SCK, SCL, SDA. Let's take a look at all the pin options! #2 through #13 - These are general purpose GPIO. #13 - GPIO #13 and is connected to the red LED marked L (see note below) next to the USB jack. Also PWM output. 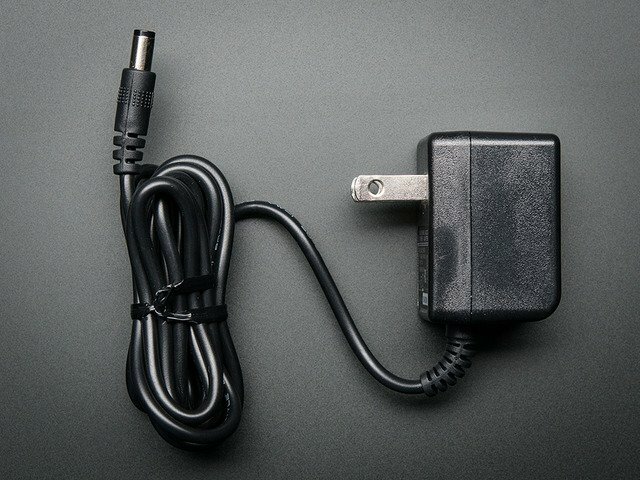 A1 - This pin is analog input A1 but is also an analog output due to having a DAC (digital-to-analog converter). This is the second DAC, and is 'independent' of A0. You can set the raw voltage to anything from 0 to 3.3V, unlike PWM outputs this is a true analog output. A2 through A15 - These are each analog input as well as digital I/O pins. 5V - this a 5 volt pin and not at 3.3V like the logic level of the digital pins. #22 through #53 - These are general purpose GPIO. However, some of them are also other things! #53 / SS - This is just named SS for back-compatibility with the Mega's SPI slave-select pin. 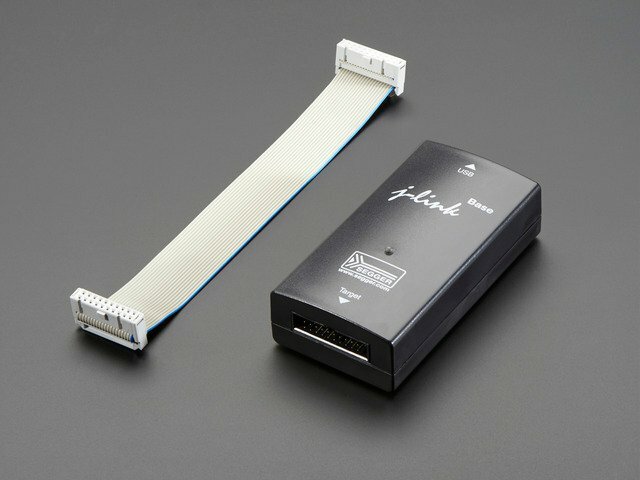 There's a 'camera' input peripheral you can use with some camera chips to capture video with 14-bit data width. We thought this was neat so we made sure all those pins were available. Here are the PCC pins (left) and the Grand Central M4 pins it's mapped to. 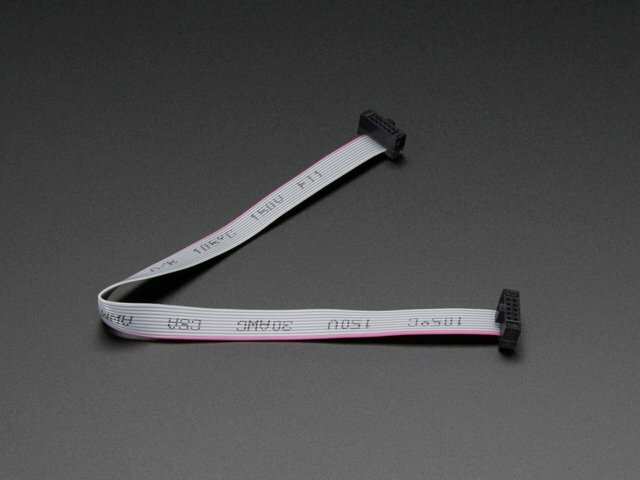 Unlike other peripherals, you cannot mux these signals to other pins! This list is organised as PCC Pin: #GC Pin. 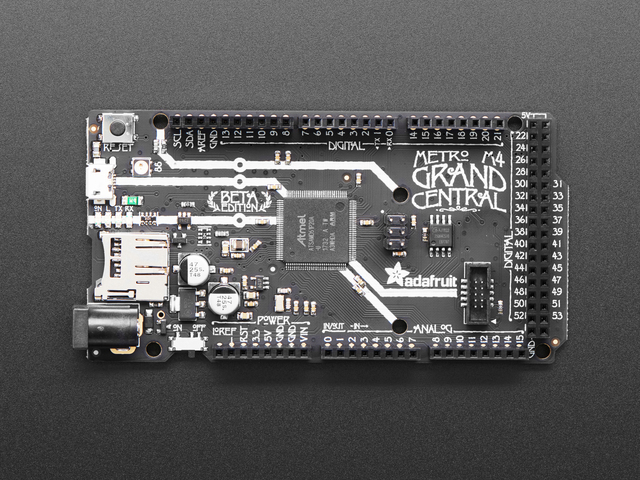 As part of the 'Express' series of boards, the Grand Central M4 Express is designed for use with CircuitPython. To make that easy, we have added two extra parts to this Grand Central M4: a NeoPixel (RGB LED) and an 8 MB QSPI (Quad SPI) Flash chip. The NeoPixel is connected to pin #88 in Arduino, so just use our NeoPixel library and set it up as a single-LED strand on pin 88. In CircuitPython, the NeoPixel is board.NEOPIXEL and the library for it is here and in the bundle. The NeoPixel is powered by the 3.3V power supply but that hasn't shown to make a big difference in brightness or color. The NeoPixel is also used by the bootloader to let you know if the device has enumerated correctly (green) or USB failure (red). In CircuitPython, the LED is used to indicate the runtime status. 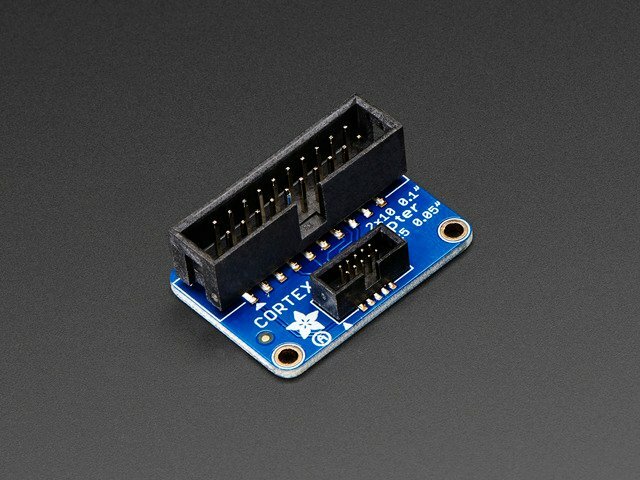 The QSPI Flash is connected to 6 pins that are not brought out on the GPIO pads. This way you don't have to worry about the SPI flash colliding with other devices on the main SPI connection. However, the QSPI port is not also on an SERCOM. So, you have to either use the QSPI peripheral or bitbang SPI if you want to talk to the chip. We have an Arduino library here which provides QSPI interfacing for Arduino. In CircuitPython, the QSPI flash is used natively by the interpreter and is read-only to user code, instead the Flash just shows up as the writable disk drive! 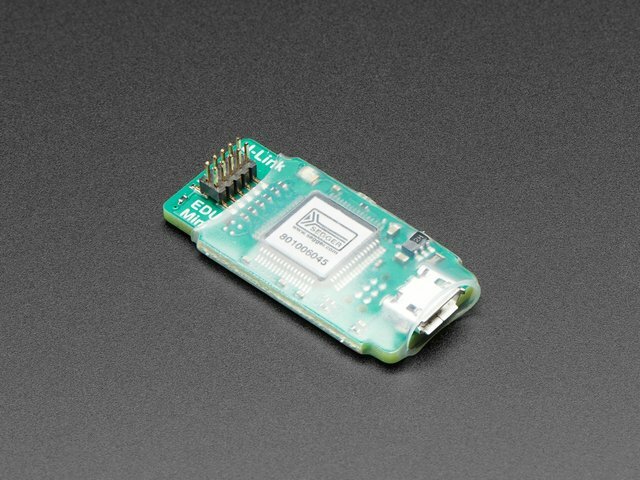 We've included a micro SD card slot on this board! This is also on a separate SPI port, so it doesn't collide with the SPI header/port used for other devices. In Arduino this is called SPI1 and by default, the SD library will know to use this for SD card interfacing. So, if you have a shield with an SD card slot, you won't be able to use that SD card connection! The library will always use the onboard SD card socket instead. Using an SD card with CircuitPython is super simple. We've written a quick demo that uses the temperature sensor built into the microcontroller to log temperature to a file on the SD card. For more details, check out the explanation in the SD card guide. Let it sit for a bit, and then unplug it and remove the SD card. Place the SD card into a reader on your computer to view the temperature.txt file. ARef - the analog reference pin. Normally the reference voltage is the same as the chip logic voltage (3.3V) but if you need an alternative analog reference, connect it to this pin and select the external AREF in your firmware. Can't go higher than 3.3V! Note that due to a silicon bug with the DAC, this is default-jumpered to 3.3V - you will have to cut the bottom jumper to disconnect it. You can use any 2x5 0.05" pitch SWD interface to connect. 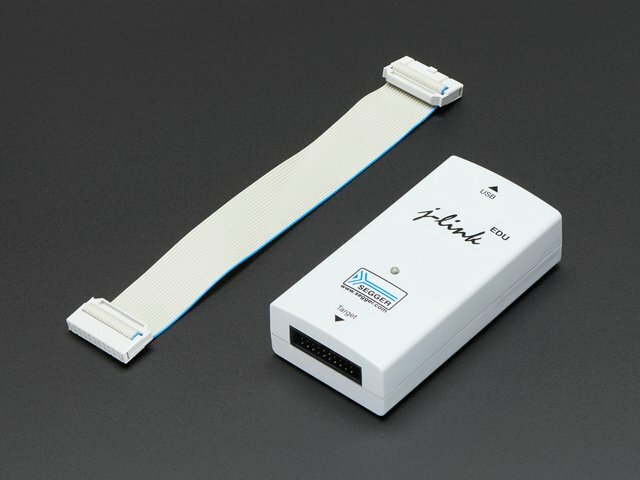 We suggest a J-Link, it's supported by every IDE/software that can program the ATSAMD51. You'll need an adapter and cable to convert the 2x10 JTAG cable to SWD. This guide was first published on Jan 12, 2019. It was last updated on Jan 12, 2019. This page (Pinouts) was last updated on Apr 26, 2019.